Undefeated BYU is the No. 1 women’s volleyball team in the nation and No. 24 Utah is also rolling. The rivals meet Thursday night in Provo. Francisco Kjolseth | The Salt Lake Tribune BYU's Veronica Jones threads the ball between Utah players Eliza Katoa, left, and Brenna DeYoung in the annual meeting between the schools' women's volleyball teams at Utah. Provo • BYU women’s volleyball star Roni Jones-Perry learned the Cougars are ranked No. 1 in the country for the first time since 1986 when her husband texted her the news on Monday. The No. 24-ranked Utah Utes are surely aware of that, too. 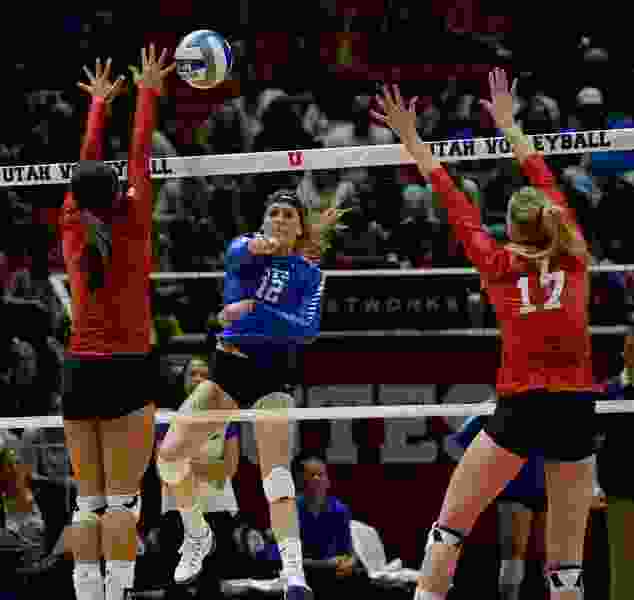 The BYU-Utah women’s volleyball rivalry never needs any extra spice, but it will have some Thursday night in the Smith Fieldhouse for good measure thanks to the Cougars’ ascension to the top spot in the American Volleyball Coaches Association Division I poll. “Rivalries add this extra emotional side to volleyball that isn’t always there. At the same time, it is still volleyball. They are a good team. We are a good team. It is just going to be really high-energy game,” Jones-Perry said. BYU coach Heather Olmstead generally downplays the rankings, but she did allow for some moments of celebration when the Cougars got the news Monday. BYU owns a commanding 70-30 lead over Utah in the all-time series, but the last few matches have been razor-close. BYU won in five sets last year in Salt Lake City; Utah won in five sets two years ago in Provo. The Cougars rose to No. 1 with a victory over then-No. 1 Stanford two weeks ago and followed it by taking the Marquette Invitational. The Cougars swept No. 10 USC and previously undefeated Syracuse and then knocked off No. 25 Marquette in four sets. Utah (7-2) is having another solid season after having been picked to finish eighth in the Pac-12. The Utes went 2-1 at last weekend’s Villanova Invitational, debating Temple and High Point before falling to the home team.